They also require more care in the “cleaning” department. Because of the way most front-loading washers are built, they tend to pool water in their drums, which can be a breeding ground bacteria and mildew. Whether your front-loading washer smells “dirty” or not, you’ll want to follow proper procedures to keep it clean. First, only use High Efficiency detergent. High Efficiency detergent is super-concentrated and creates fewer suds than traditional laundry detergent. Fewer suds means more soap is drained in the rinse cycle, leaving fewer chemicals and fragrances to sit in the drum. High Efficiency detergent is also sold fragrance-free. 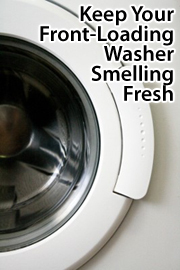 This is the preferred variety for a long-term, stink-free washing machine. Next, at least once weekly, take a dry cloth and wipe the inside rim of your front-loading washer. There, you will find a wide plastic tube in which water settles between loads of laundry. If you find stains or grime, remove it. If your washer has a drain filter on its front-lower edge, remove the filter and allow the water to drain — preferably onto a towel or into a bucket. Then, lastly, consider running an empty cycle with just bleach and water. This is optional, but can help remove lingering stench. Once your front-loading washing machine is cleaned, going forward, after each load runs, try leaving your washer’s front door open. This will allow fresh air to circulate through the washer and help drum-settled water to evaporate. With less water and humidity in the drum, bacteria growth is slowed.